Billy Donovan: The Spread "Pick & Roll Offense"
Coach Billy Donovan has mastered the pick and roll offense, which has led to back-to-back NCAA championships, and has begun to duplicate itself in hundreds of gyms across the country. He begins by exploring the philosophy and building of this effective attack, starting with the flat pick and roll by a post player at the top of the key. He teaches the flat option 5-on-0, then shows it in action 5-on-5. Multiple opportunities to score come from this one concept in the half court. Major teaching points in the offense include: reads, slipping, spacing and screening angles. Real game situations are presented to help coaches anticipate their opponent's strategies when playing the pick and roll offense. Donovan has discovered three main ways the pick and roll is defended in college, and instructs the offense how to counter every move, including the switch and double team trap. 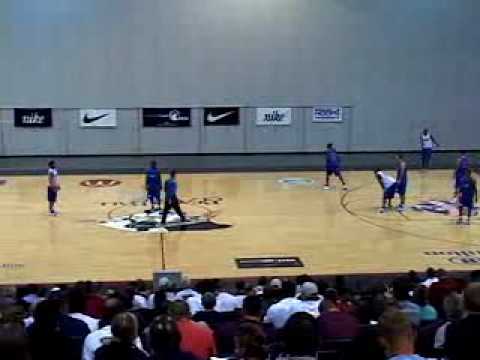 When attacking the defensive 'show,' Donovan teaches the slip or ball reversal. This offense forces the defense to get back in transition and match up quickly, constantly close out and contain penetration. Every defensive adjustment to the pick and roll can be countered by the pick and roll. Good video on the pick and roll. I recently heard him speak in Pittsburgh, and the guy is extremely smart. He talks about a few concepts that you wouldn't normally think of when you think of the pick and roll. One of the better videos I've seen for sure. Very happy with this video. He showed many different sets with the offense and how to adjust to what the defense is doing. 1 Ratings were entered with no review. Billy Donovan: The Spread "Pick & Roll Offense" 5.00 out of 5 based on 3 ratings. 4 user reviews.